Why choose us to build a website? Your website comes complete with a built-in online store so you can sell information, digital products, ebooks, or any other type of product you wish. It's up to you! It's all included for ONE LOW monthly fee of $19.98. Are you unsure if we are the right solution for you? Try us free for 10 days! There's no commitment and no credit card is required, so as you can see you have nothing to lose by taking a free 10-day trial today! Do you need to build a website or build an online store? Do you want to avoid the big price tag that comes with having one custom-designed? You don't need to pay thousands for a custom-made site. Do it yourself, the way you want it. Not only will you save money, you'll have your site up and running in 24 hours or less. Don't worry: you don't have to know web design or programming. With our Best Website Builder, even a novice can build an online store or website in minutes. Best Easy Website Builder lets you customize and tailor a site or online store that exactly fits your needs. 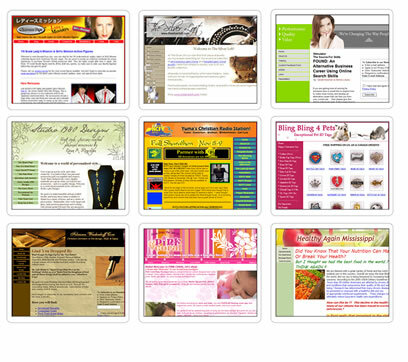 With over 1,700 templates to choose from, your site will be uniquely yours. We've created the best website builder on the market, one that's simple to use and easy to edit. Our software was made for the non-designer and non-programmer with easy-to-understand instructions and the ability to add your own information to each page. You'll be able to view your pages instantly, before uploading, so you'll know exactly what your visitors will see on their screens when they look at your pages. Besides our massive selection of templates, you'll also have access to thousands of stock images, plus over 30 other features. There are no "tiers" to choose from, no gimmicks to try to get you to spend more money. Every single feature is yours when you pay for your subscription: dozens and dozens of features- one low price. You won't find a similar package anywhere else for less money. Keep more of your own money so you can invest it in other aspects of your business. This easy website builder lets you do that and still end up with a site that not only looks like it was professionally designed, but also allows you to sell online and conduct your business exactly the way you need to. Best Easy Website Builder will save you time, money, and will help your business get to where you want it to be. Home | Features | Sample Sites | Support | Website Builder | Sign Up Today!